We are excited to announce the arrival of our newest teammate, Matt Donohue, Certified Public Accountant and Certified Financial Planner™. 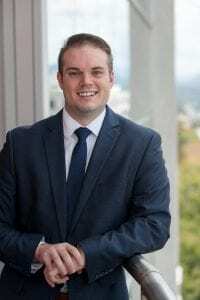 Matt is also a Level 2 candidate for the prestigious, Charted Financial Analyst® designation (highest distinction in the investment management profession). Matt will be working closely with Matt Groome to service your accounts with our firm. In addition to his financial planning role, Matt Donahue was hired specifically to build out our investment trading platform. It is bittersweet for us to announce that John Igharas has left the firm. John has been instrumental in working with our clients through the years. John was given an incredible opportunity to get back into a Trust Officer role, where his roots and passion for financial services endure. John and his family will be moving to Greensboro for his new position. John is a close friend of our family and has become friends with many of our clients. We will miss John but know he will come back to visit. We will be working to find a new team member to fill John’s role. If you know of any Financial Advisors looking to make a change, please let us know. At Colton Groome, we are constantly thinking about how to better serve you. If you have questions, do not hesitate to reach out to our team.